How are Traeger Grills different? 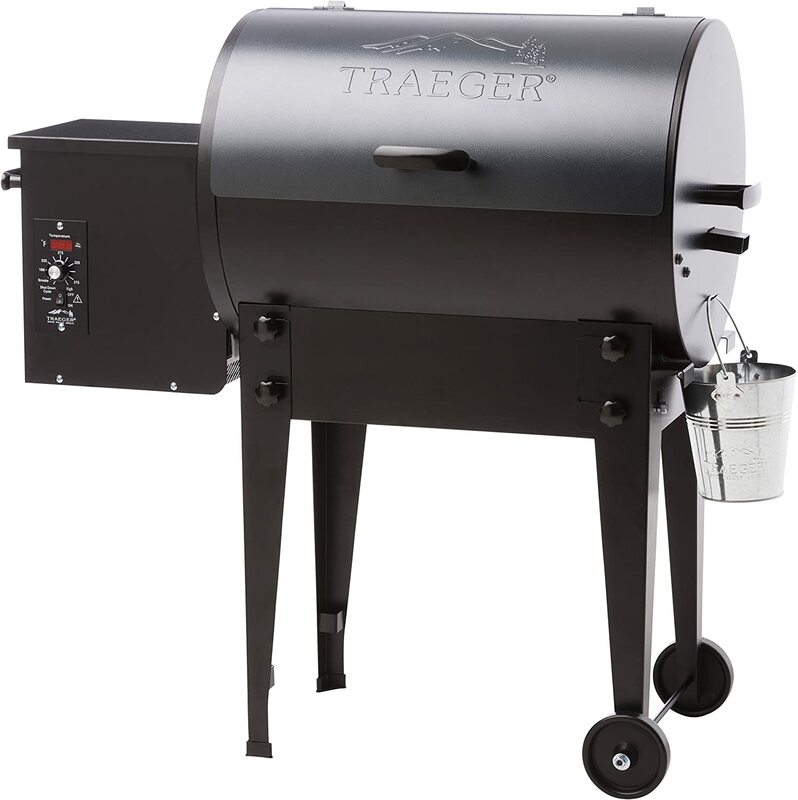 Traeger Grills offer a unique line of wood-fired pellet grills. The auger at the bottom of the hopper pulls the hardwood pellets into the fire pot. Here the pellets strike the hot rod and ignite. Simply set the temperature and begin cooking! Convection-style heat cooks food evenly and the pellets create a flavorful smoke. The Traeger Grills Select Elite features wood-fired convection performance with traditional BBQ good looks. Complete with stainless steel side shelves, an enclosed storage space, 3-piece porcelain grill grate & 589 sq. in. grilling area, you can transform your backyard into a barbecue hot spot. 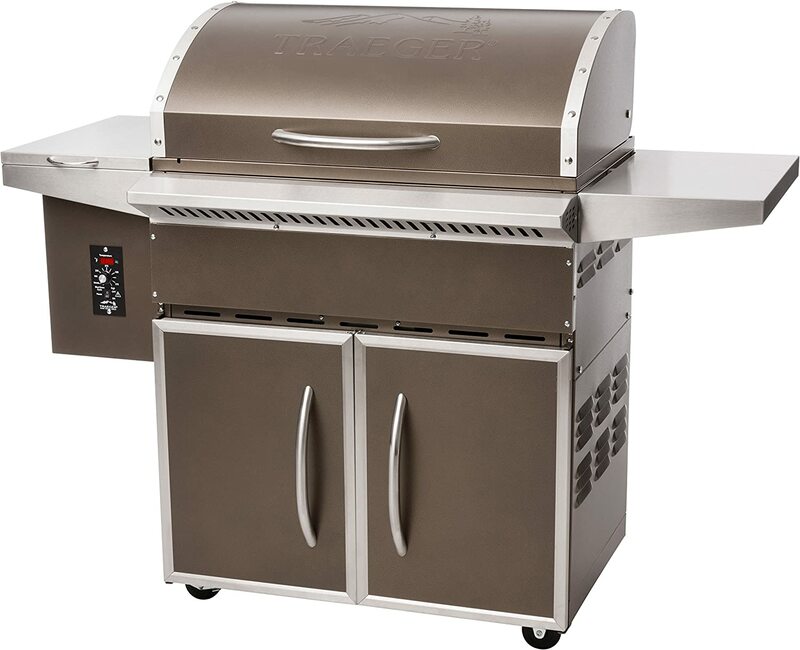 Enjoy the robust power and profile of the Traeger Grills Bronson 20 Grill in the heart of the city or the suburbs. Nestled on your patio or balcony, this HOA-approved grill has no open flame and a simple on/off switch. Grill out and dine-in every night. From the truck to the game or the cabin, the Traeger Grills Tailgater packs a full-size punch in a portable package. It weighs only 62 pounds and comes with EZ-Fold Legs for max portability. Infusing big, wood-fired taste in tight spaces, now you can grill, smoke, bake, roast, braise, and BBQ wherever. Traeger grills are known as the Original Wood Pellet Grill. Continuous fuel and consistency are the trademarks of Traeger grillg, which was first developed in 1985 to fuse the capabilities of a traditional grill, the ease of an oven, and the wood-fired taste of a smoker. 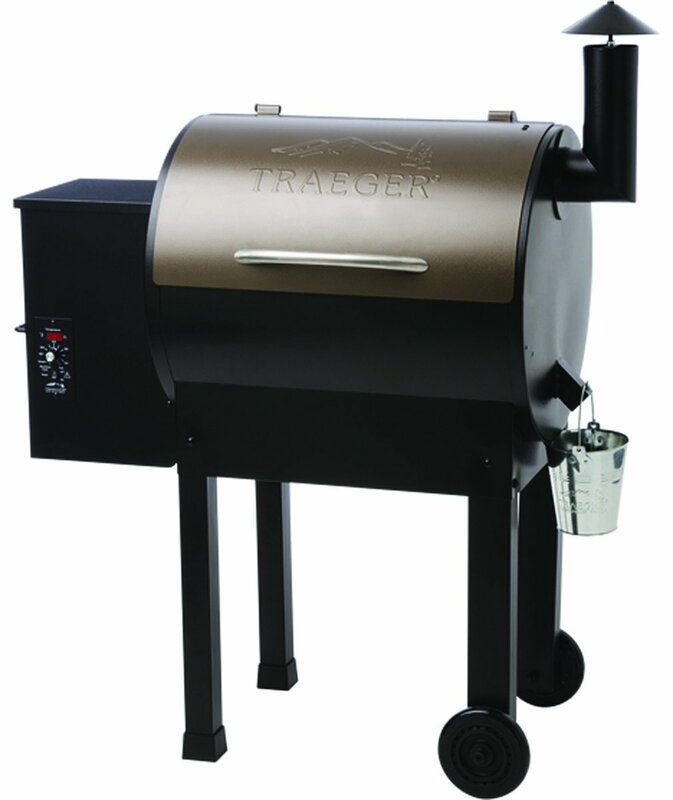 The Traeger grill has a classic grill look, with a smoke chimney and a Traeger grill hardwood pellet hopper. The inside of a Traeger grill is fitted with a rotating auger to slowly transfer the Traeger grills hardwood pellets to the Fire Pot, where a draft-induction fan activates to circulate the rich hardwood smoke to distribute heat, flavor, and air. Combining grill and smoker, Traeger Grills revolutionized the way both avid grillers and smoker aficionados work their respective magic. 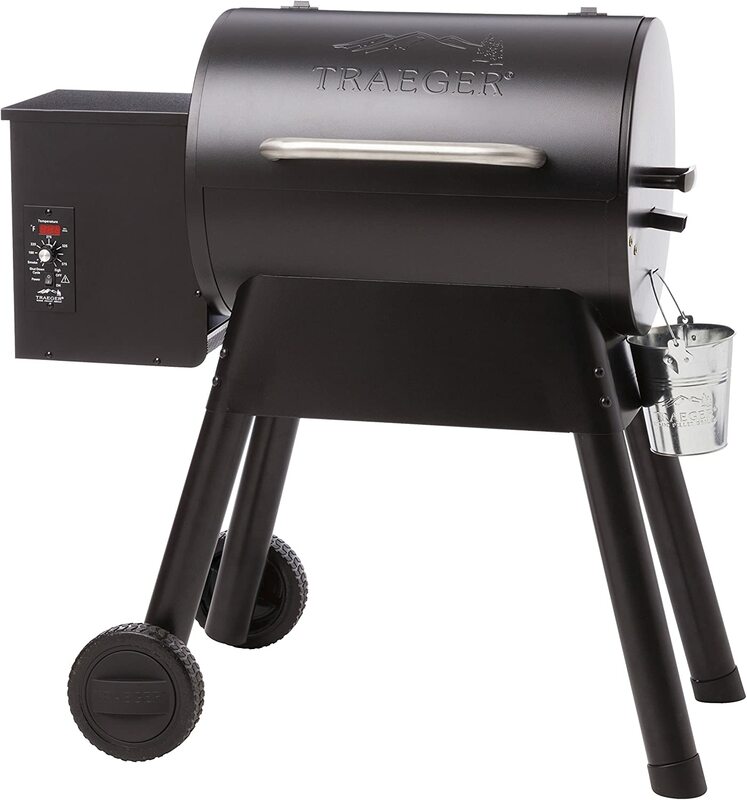 Those who are fans of gas or propane grills love the continuous fuel that Traeger grills provides, and smoke devotees swear by the Traeger grill’s ability to incorporate indirect heat from the Traeger grill Fire Pot. Traeger grills come fully automated to take some of the guesswork and tedium out of grilling. Using only natural Traeger hardwood pellets, Traeger grills have a digitally controlled convection heating system to make wood-fired cooking safe, easy, and consistent. With a temperature range of 150 to 450 degrees, Traeger grills are versatile enough to handle cooking, smoking, grilling, roasting, braising, or good old fashioned BBQ. With a diverse and thorough catalog of features and benefits, each Traeger grill comes with its own bells and whistles to satisfy any grill enthusiast. Some Traeger grills include all-terrain wheels to enhance portability and neighborhood popularity. Want a Traeger grill with a bronze lid to match backyard décor? They’re all over it. Electronic auto-starts and computerized augers are just the tip of the iceberg for the world of Traeger grills, where convenience and efficiency meet cooking finesse.